Most of us have seen this car posted on one blog or forum during this past year. Personally, I find this car to be a fine example of what custom cars have always been. In a sea of v8 powered classic muscle this car stands out and with good reason. The photography and videos in this ebay listing are among the best I have ever seen. Take a look for yourself! It looks like there will be no Indy Pace Care replica Camaro in Chevy showrooms this summer. Chevrolet will produce a Bumblebee edition for those who like the Bumblebee Camaro from the Transformers movies. I give GM credit for not flooding their own market with different versions, something Ford has had no trouble doing with so many version of the Mustang on the option order sheets. ORLAND — Northstate Motors, Glenn County's only new car dealership, already threatened by cutbacks from General Motors, suffered another blow early Friday morning when a new, $30,000 Chevrolet Camaro was allegedly stolen from the lot. An Orland police officer saw the car turn onto East Walker Street about 3:18 a.m. and immediately tried to pull it over. The driver sped toward Interstate 5, then headed north, leading Orland and California Highway Patrol officers on a high-speed chase. Due to public safety concerns, the pursuit was called off. The bright yellow vehicle was found later Friday morning in Klamath Falls, Ore. Police there said they had one person in custody in connection with the alleged theft, but didn't release a name. American tuning house Artisan is teaming up with Turbochargers.com to create a turn-key tuner out of the brand new 2010 Chevrolet Camaro SS. Using a similar formula as its Lexus IS-F SEMA car, the crew is using a duo of rear-mounted GTK350 turbos, a cat-back exhaust, intercooler and a tweaked ECU to gain a total of 600 horses from the SS' 6.2-liter V8. The body gains a 1.5-inch flare on the front guards and a three-inch stretch in the rear where a set of 21-inch (front) and 22-inch (rear) iForged rims live, framing massive 14-inch SSBC Brakes. A replacement front lip, rear diffuser, gauge package, Artisan-embroidered head-rests, BASF Glasurit paint and a token numbered plaque finish off the upgrades. All the go-fast parts are for sale separately but the full turn-key package will cost $69,000 USD when the Artisan SA-600 goes on sale stateside this June. 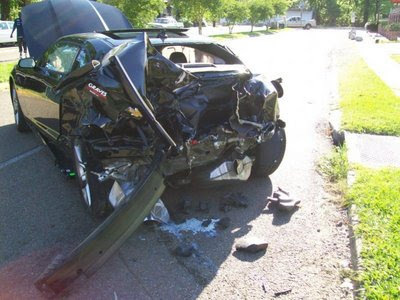 This was posted on http://www.5thgen.org/ today, black Camaro was rear-ended, story goes the car was 20 hours old, hit by someone without insurance or a drivers license. We have yet to verify the details. 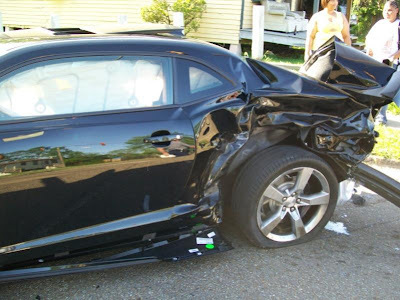 Regardless, you can see the Camaro held up very well all things considered. 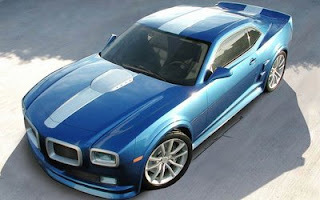 The Michigan based design firm ASC Creative Services, has released images of a Pontiac Firebird that can be yours if you provide a 2010 Chevrolet Camaro and a fat bank account. The body kit includes Firebird decals and other styling cues that make it hard to miss. DETROIT (AP) — General Motors Corp. says it is recalling about 300 new Chevrolet Camaros because a battery cable could rub against the starter motor, wearing the insulation and potentially causing the car to stop running or fail to start. The voluntary recall applies only to some Camaros with V-8 engines (SS models). The company says in extreme cases the cable problem could cause a fire, but no fires have been reported. GM spokesman Dan Flores says the company has made about 1,400 of the V-8 equipped 2010 Camaros and 300 have been sold. The unsold models will be fixed before they are delivered to customers. Flores says GM will tow the cars to dealers and offer free loaner vehicles and oil changes. Jacob's Heart Children's Cancer Support Services is holding a raffle with a grand prize of a 1969 RS/SS convertible Camaro, professionally rebuilt by the brother of an original Jacob's Heart child. Jacob's Heart is currently serving 100 children in-treatment for cancer in Monterey, San Benito and Santa Cruz counties, ranging in age from birth to 18 years.